Integrated solutions that seamlessly weave effective Internet applications with a web site, places your organization notches above the competitors. Our web application developers build robust, secure and customized solutions using flexible building blocks. Our web apps developers firmly believe and follow practices like code reuse and web application frameworks that help improving productivity. At the same time maintain a balance to ensure that components required specially and frequently by an application, are best developed in-house. Our expert team will deliver rich internet applications combining our solid cross-domain experience, technological expertise and an established development methodology. You have come to the right place! Swap IT Solutions, the one-stop-shop for all your web application needs! Our developers excel in producing unique, powerful, search engine friendly and intuitive web applications, irrespective of the technology used. Our services include web programming & database integration for portals, matrimonial sites, on-line property searches, shopping carts, e-commerce applications, forums, blogs and custom applications which will facilitate your business. We use programming languages and code to build a successful web model. 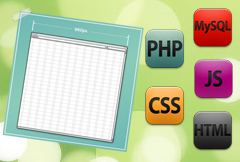 Swap IT Solutions uses the following comprehensive range of Application Development technologies: HTML/XHTML, PHP, ASP, ASP.Net, MySQL, Flash, Flex Builder, Silverlight, Java, Java Script/Ajax/Jquery, XML.